The Pow’RBall is a gilding metal jacket filled with a lead core that’s shaped into a Patented “V” shape, then capped with a round polymer ball which is crimped and held in place by the copper jacket. During flight, the polymer ball disperses air around the bullet making it more aerodynamic, which improves ballistics. The ball also enhances feeding in auto pistols. During impact the polymer ball delays expansion allowing it to penetrate several inches before it is pushed out of the way exposing the lead “V” shape cavity, causing the bullet to fully expand properly. 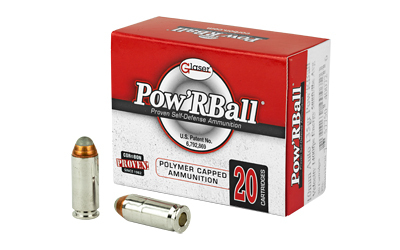 Another benefit of the polymer ball is that it protects the integrity of the hollow point by not allowing clothing or other material to plug up the hollow point cavity causing it to fail to expand.